THE SOJOURN: Twilight to Burn Notice! There comes a time in everybody's life when you need a little self assessment. Now I for one am very fond of self assessments. They are sort of a hobby. When I have nothing to do, I sit back, relax and..think. Weird? Well that's me. The time that I took away from the blog did not mean that I stopped writing completely. I was writing on and off just not on my blog. Exams were okay etc., life is going on the way it has since the beginning of time. My new interests? I just realized that I hardly had four more months before the university kicked me out. I also realized my new found love for my subject. I realized that my student life was coming to an end, like that of my friends. At least since the time we were studying we could at least have this "idea" that we were still kids and hold on to a piece of our childhood. But that period is about to end. Now I know why grownups continue to remember their childhood no matter what. I have finished about 70 pages of Twilight after 2 years of struggling. It is a good book to read if you are depressed. ONLY if you are depressed. Just the thought that somebody could be so depressed enough to write such a book and there are a million more depressive souls who made it a best seller makes me feel better about myself! But enough of Twilight bashing now. I like vampires, I don't like werewolves much. I can relate to Bella's character a lot, however I have a problem with the presentation of the book. Reading Twilight is like reading a Class V "Children's Bed Time Story" Book. However it surely is a book of one kind. Problem is that I have never fallen in love with guys like Edward before. Attracted may be. But never love. 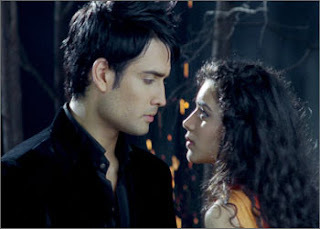 Speaking of which I am really liking the new Hindi serial which is influenced by Twilight. The hero of that series, "Abhay" is "fu**ing hot" to quote one of my friends. She is a die hard Twilight fan but after watching Abhay, she has stopped admiring Pantyson..or whatever his name is. I wonder how long I will like this series, partly because I am scared to death of Ekta Kapoor serials but I like the youthful vibrancy of this one. Another series that had me hooked up until recently when it ended is "Lie to Me". One of the most educative serials I have seen till date. entertaining too once you got past the entertainment. Analyzing faces while they talk, now that's something. But the series that replaced Lie to Me, the so called "James Bond of TV" got a cynical glance from me at first sight. "Some days you have to wonder if the position you are in is the worst you can be in. Fact is, whether you are a soldier captured by enemy forces, or a Burned Spy in Miami without much of anything, the answer is almost always no: It can always get worse." "Guns make you stupid. Better to fight your wars with duct tape. Duct tape makes you smart." "Asking my mom for something is like asking for a favor from a Russian mob boss, he'll give you what you want with a smile...but you'll pay for it later"
"Some times the truth hurts. In these situations, I recommend lying." "Thirty years of karate, combat experience on five continents, a rating with every weapon that shoots a bullet or holds an edge... Still haven't found any defense against Mom crying into my shirt." "One of the things covert operatives have to give up is the idea of a fair fight. Spies are not trained to fight fair. Spies are trained to win." These are some of the most awesome Burn Notice quotes. Sam is Michael's friend and Fiona, an ex IRA bomb expert is Michael's ex who helps him on his cases. Together the three of them solve cases and try to find out why Michael was burned and what to do next. Jeffrey Donovan plays Michael Westen with so much credibility that I find it impossible to accept anyone else in his role. A cup of intelligence and action, a spoonful of Michael, a bit of Fiona's violence (which btw only makes her complement Michael when compared to his restraint) and a little of Sam's comedy- and there you have Ta Da... a steaming Hot Burn Notice Episode!